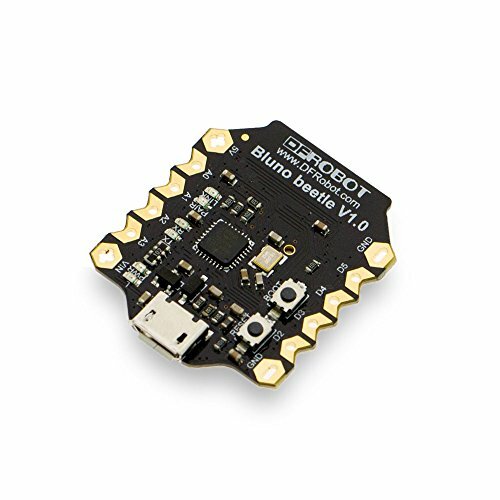 The Beetle BLE (Former name as Bluno Beetle) is an Arduino compatible Bluetooth 4.0 enabled board. It is probably the smallest Arduino BLE board in the market. It uses standard Arduino IDE to upload codes via without any extra library and drivers. This Beetle BLE is another milestone in the Beetle line, which makes DIY users have more options in the project design. It is fully compatible with Bluno in instructions and procedures. Support Bluetooth HID and ibeacon modes. The Beetle BLE offers a super tiny and low cost Arduino with bluetooth 4.0. The Beetle BLE can be used for disposable projects, such as DIY projects, workshops, gift projects, E-Textiles wearable and educational. For students and makers who cannot afford too much on hardware purchasing, Beetle can be a great solution for them. Just like a native Arduino board, but with Bluetooth 4.0. An APP called Play Bluno is available on IOS and Android which gives a quick access to this little tiny board. It not only supports USB programming, but also wireless uploading method. With the V shaped gilded I/O interface, it is convenient to screw conductor wire on it, which could a good choice in the wearable market.